Fall. It’s a time that brings about a chill in the air, an excitement for what’s to come and the beginning of life’s busy season. Whether you’re a mom, a college student or working, the first thing that usually goes during this busy time is either grocery shopping or cooking at home. We, or at least I, tend to see it as burdensome or tiring. When we decide that we would rather pick something up or order in Postmates, the choices tend to be ones you wouldn’t have made had you cooked ahead — and also a lot more expensive. 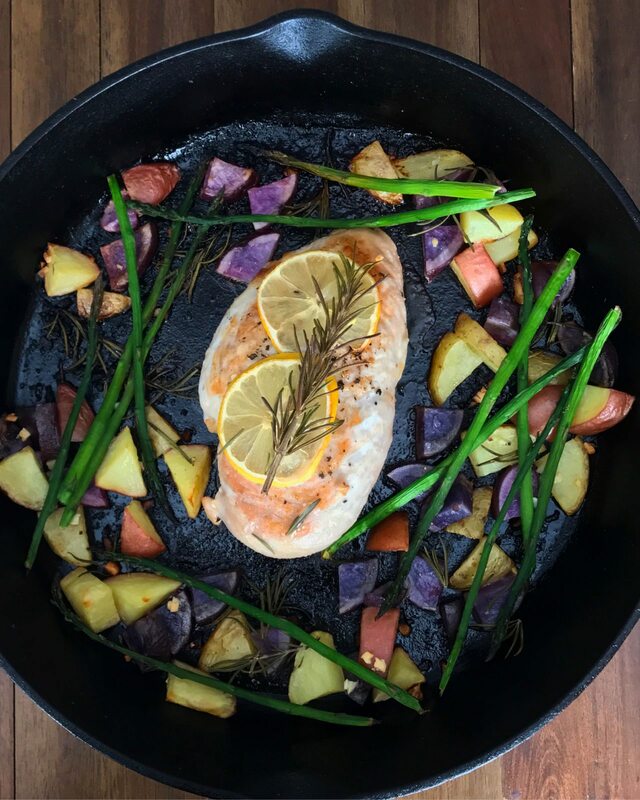 When thinking about one-pot meals, there are some guidelines to keep in mind to ensure that you’re making or eating meals that will 1. fill you up, 2. have a good balance of macronutrients to help balance your hormones and 3. have all the good vitamin, minerals and antioxidants that our bodies need to stay healthy. That last one is especially important during the fall when the weather is changing and the rate of colds rise. – Fiber (lentils, beans, nuts, brown rice, broccoli, brussels sprouts, etc.). Choosing meals containing these food groups won’t only be producing amazing health benefits, but will be tasty and exciting. If there is a recipe that you like that doesn’t have a good fat or greens, a quick fix is to have salad and avocados on hand. This way you can add a side salad to any meal. Have fun when choosing recipes and don’t feel restricted. Look at these recipes as guides and put your own flare or spin on them! It will keep your palette happy with new flavors, textures and choices by mixing things up a bit. If you don’t have a cast iron no worries. You can use whatever pan you have instead. Also, you can omit the asparagus and have a salad for your greens or choose a different veggie. Recipe here. Easy go to for cold day. By using store bought chicken you are saving a ton of time. If you want to make your own chicken do in slow cooker day before, can use for pho and then on salads rest of the week. Recipe here. Incredibly versatile meal. You can put on a bed of lettuce with some avocado or on a sprouted wheat tortilla with some guacamole. Recipe here. You can use the chicken from the Salsa chicken that you have left over. Recipe here. This one can be made ahead of time and heated up when you have it that night or day. Recipe here. You can mix up the veggies on this one to get more fiber. You can add sweet potatoes rather than the tomatoes. If you do, make sure to cut the pieces small so they cook faster! You can also trade out the green beans for asparagus, broccoli, etc. Recipe here. This rub is so good! You can put it on so many other veggies and roast them to have as a great addition to salads. When I have made these in the past I have omitted the creamy lime sauce and replaced with avocados/guacamole or the avocado lime sauce from the stuffed sweet potatoes. Recipe here. What’s your go-to one pot meal? Amanda is a Registered Dietitian and has her Masters in Nutrition. She is a recent transplant to Los Angeles from the good ole’ state of Texas. Her area of research dealt with fat metabolism and hormones relating to fullness. She is currently soaking up the sun and culture of LA with her husband, Kyle, and dogs, Corey & Topanga. She is a sucker for barre classes, a good pair of denim, and a nice cup of coffee. To keep up with her views on nutrition and life visit her website. These are brilliant! Almost all my dinners are one-pan. Thanks for the beautiful inspiration! These meal all look so delicious, especially the One Pan Salmon. I love one pot or one pan dinners – they’re quick and easy to make and are always delicious. Plus, no better time for roasted veggies than fall!